Led by Bruce Cates, who has been with the company since 1981, our talented painting and refinishing crew can handle all your painting and refinishing needs on any type of boat and any type of surface. 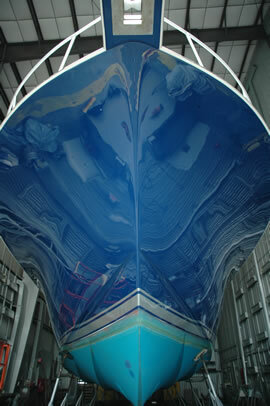 Our facilities include a climate controlled, twin bay work building which allows the paint crew to prepare and finish paint jobs with all major marine products, such as Awlgrip, Imron, Interlux and Alexseal paints as well as perform other custom work and special projects. Bruce’s team handles major varnishing and refinishing projects on wooden vessels as well as brightwork on other yachts, and puts the finishing touches on much of the custom work that is done by our Carpentry Shop on interiors as well as exteriors. For more information or to get a free quote, please contact James Taylor at (800) 992-2489 or info@atlanticyachtbasin.com. I think you are the first yard we have worked with (and there have been many) where you came in on time and on budget. You are clearly the exception. We have NO complaints! Only accolades!